Beautiful, sad, with a sense of peace in the end. The thought of him being able to roll up his pant legs, without help, seems foriegn, knowing near the end he had to have help putting on his socks and shoes. You’ve captured a metamorphis so big and yet so subtle it would be hard to see. Thanks, Kathy. Metamorphosis happens in many ways. I’m glad you liked this. I was worried about how family would react. Yes-your comment brought the memory of John Hurt lying down to sleep forever at the end of that film. Not seen it for many years. Yes!! I’d forgotten about that movie – I loved it! That choice he made at the very end of the film, that’s exactly what this story is about. Mary, this is so beautifully written; poignant and bittersweet. I love the line “…as he stood at the precipice of waiting…” Gorgeous photograph too. Thanks so much for your lovely comment, Linda. I’ve been kind of scattered this month – lots of things going on, difficulties connecting to internet on anything bigger than an iPhone or iPad. Just stuff. I felt like I really need to get back to writing *something*, anything. Thank you,Trish. That is so kind of you. Wonderful piece of short fiction! Definitely, write more! Thank you, Lorinda. I’m so glad you like it! I so love your writing. This is beautiful and powerful. Full of feeling. Thanks so much, Cathy. I appreciate that. This was personal for me, so I guess that’s where the feeling comes in. 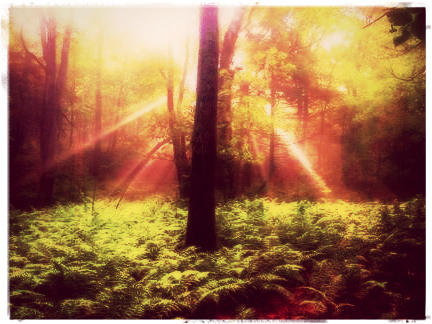 “A fern-floored forest where sunlight split the top of the trees and shone rose-colored on one massive tree…” Beautiful, Mary, as was the entire post. I’m sure it was very emotional, cathartic even?, to write. As Kathy, I felt a sense of peace from the ending too. In essence, individuals create their own destiny. Thank you, Christy. I was just recommending The Art of Racing in the Rain to my mother and my sister, though I have yet to read it myself. I keep hearing wonderful things about it. You must be a voracious reader. I was at your blog the other day, marveling at how you find the most amazing quotes! I love them all. As well as your taste in music. I need to go tell you that. Thanks Mary, I do love to read. Art of Racing was a difficult read for me though–the subject matter of cancer was difficult having lost my mom to cancer, but it was certainly a cathartic read. I do recommend it, but it’s not an entirely happy, happy, joy, joy book as one would initially believe. Oh, you don’t need challenges, mama. Your stories spill out as if from a mystical spigot. Always wow. Always. And you, sir, are so good for my ego. Thank you, thank you, a thousand times over. It’s more heartening than you know that I not only have some readers, but that they also like what I have to say. Kinda makes it all worth while. Thank you, MY dear friend. Thank you for thinking so. You captured this theme so well. Word by word, the imagery was unveiled; the thoughts and observation of this man shown as he transformed into something new. I love how your also allowed us to see life again through his transformation. I wish you’d write something about this someday. Or perhaps, a book. Wow. This is good, lightly worded, rich in imagery. Was it fun to write? I think this may be the photo.